How important is Industry as a regional employer? Industry’s share of total employment has changed considerably over the past two decades (Fig. 1). Ireland’s move to a more service-based economy, with substantial losses of traditional, lower skilled Industry and a growing focus on high value, high-tech manufacturing, has substantially changed the significance and nature of industrial activity in Ireland and the region. In 1996 21% of total employment in the Western Region was in Industry, the share declined in every Census to a low point of 13% in 2011, increasing somewhat to 13.7% by 2016. The state showed a similar pattern declining from 20.4% in 1996 to 11.4% by 2016. While both region and state followed similar patterns, the gap between them widened over the period so that in 2016 Industry was notably more important as an employer in the Western Region. At a county level, the most dramatic change occurred in Donegal; from over 1 in 4 working in Industry in 1996 to less than 1 in 10 twenty years later. Donegal’s economy has been dramatically restructured, with a strong shift from manufacturing to services. At just 9.2% of all employment, Donegal has the smallest share working in Industry in Ireland, outside of Dublin. In 1996, Clare had the second highest share in the region working in Industry, largely due to the Shannon Free Zone. 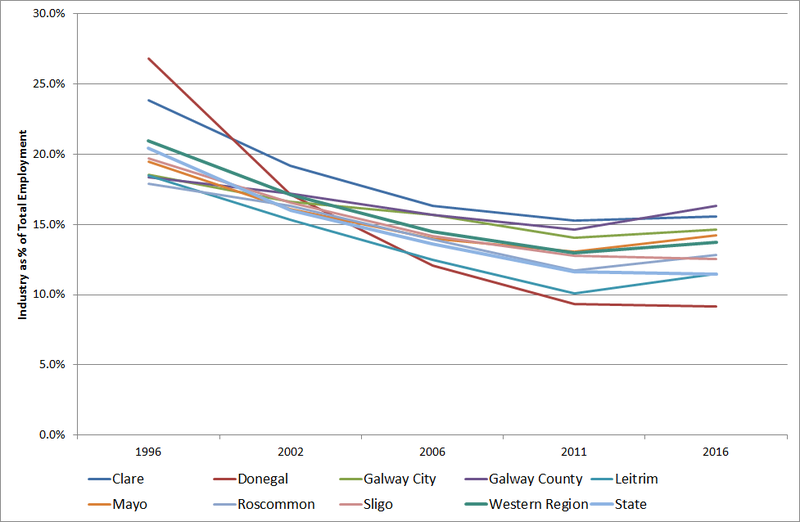 With the dramatic decline in Donegal, Clare had the region’s highest share for much of the period but was overtaken by Galway County in 2016. From having the region’s second lowest share in 1996, Galway County now has the highest share working in Industry in the region at 16.3%. Industry is the single largest employment sector for Galway County, Galway City and Clare. At town level, Ballyhaunis in Co Mayo has the highest share of its employment in Industry among Ireland’s 200 towns and cities, where it accounts for 41.9% of total employment. Shannon in Co Clare is fourth highest nationally at 31.9% with Tuam also in the top 10 towns at 25%. The region is also home to the two towns in Ireland with the lowest shares working in Industry in Bundoran (3.5%) and Carndonagh (4.9%), both in Co Donegal. It must be noted that this refers to the town where a person lives though they may work elsewhere. 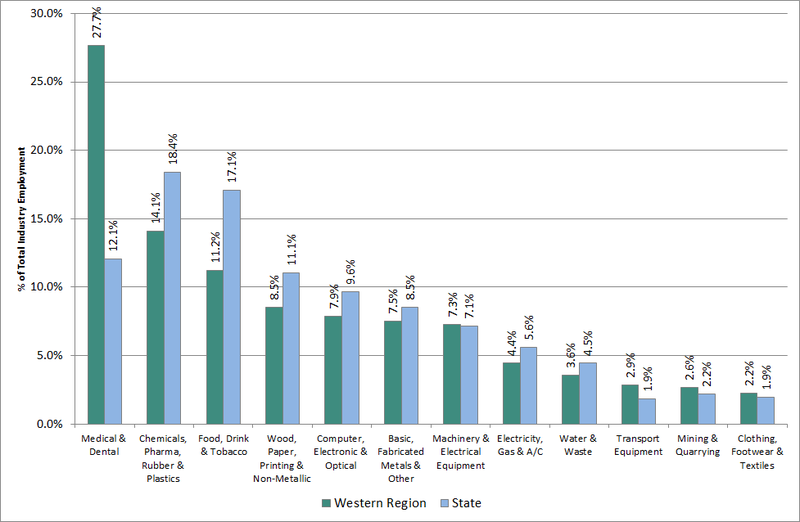 The Medical & Dental Instruments (MedTech) sector is by far the largest industrial activity in the Western Region accounting for 27.7% of the region’s total Industry employment (Fig. 2), more than twice the national average (12.1%). The region’s second largest (14.1%) is Chemicals, Pharmaceuticals, Rubber & Plastics (Chemicals & Pharma) which is the largest in the country (18.4%). The manufacture of pharmaceuticals is the main activity. Food, Drink & Tobacco (Agri-food) is the region’s third largest sub-sector with meat processing, bakery/confectionary, seafood and beverages the main activities. Agri-food’s share of industrial employment in the region (11.2%) is considerably smaller than nationally (17.1%). This is partly due to the strong concentration of such activity in the other regions and the nature of the Western Region’s farming. There are differences across counties in the relative importance of the sub-sectors. For Galway City, Galway County and Leitrim, the MedTech sector is the largest industrial employer. For Sligo and Mayo, it is Chemicals & Pharma, while for Donegal and Roscommon Agri-food is largest. Computer & Electronic Equipment is Clare’s main industrial employer. Further detail on the industrial profile of the western counties can be found here. Transport Equipment experienced the largest percentage growth in employment in the Western Region between 2011 and 2016, increasing by 52.7% (+451 people). The region had far greater growth than nationally (15.5%). This sector includes companies such as Valeo Vision Systems in Tuam, Mirror Controls International in Leitrim, McHale Engineering in Mayo and Lufthansa Technik Turbine in Clare. The next highest growth was in the region’s largest sub-sector, MedTech where employment grew by 30.2% (+2,935 people), followed by Computer & Electronic (21.2%, +633 people). Very strong growth in these three high-tech manufacturing sectors contributed substantially to the region’s stronger than average performance, with total Industry employment growing by 13.7% compared with 9.4% in the country as a whole. Industry plays a considerably greater role in the region’s economy and labour market than nationally. Its performance, and future trends in manufacturing, will have a greater impact in the region. Given the growing role of services nationally, and increasing policy focus on attracting and growing international services, it is vital that manufacturing’s central role in the Western Region’s economy is fully recognised and supported in policy decisions. There also needs to be a strong focus on developing new growth areas to increase industrial diversification. The region has a higher reliance on foreign owned firms. Global developments which impact on the extent and nature of foreign owned investment in Ireland would have very significant knock-on impacts on the regional economy, not only for direct jobs in foreign owned manufacturing, but also Irish owned sub-suppliers. Digital transformation poses a threat to certain jobs but also creates new occupations and activities. Manufacturing has already evolved substantially and adopted many digital technologies. Processing and operations jobs, especially manual work e.g. packing, are now most at risk from automation. Upskilling of the current industrial workforce should be a key regional priority. The nature of work and skills needs are changing. The share of jobs that are permanent full-time is declining and it is important that policy adapts to ensure that the rights and obligations of individuals and employers are clearly outlined and protected, for example in relation to training and upskilling. Industry’s skill needs are changing with areas of current demand including science and engineering, craft skills and operatives with digital skills. As Ireland’s manufacturing sector continues to evolve there will be growing demand for STEM qualifications. The Western Region is a global location for MedTech. The cluster includes multinationals and Irish start-ups supported by a strong skills base and research infrastructure. Life Sciences, including MedTech and Chemicals & Pharma, is present in all counties but strongest in Galway, Sligo and Mayo. It is a key regional asset but its dominant role presents some risk. Opportunities for convergence with other sectors and dissemination of its expertise should be supported to promote industrial diversification. Activities which rely on domestic demand or the UK market face challenges. These sectors play a larger role in rural counties, have high levels of Irish SME activity and are important for male employment. Manual tasks are vulnerable to automation and Brexit presents a threat, especially for Agri-food. Improving the competitiveness, as well as market and product diversification, of such firms will be important to sustaining the regional and rural economy. The region has an emerging strength in Transport Equipment. For Galway County, Mayo and Roscommon it was the strongest growing sector and Leitrim has the highest share in the country. Many of the companies are located in medium-sized or small towns and opportunities to further embed and strengthen this emerging cluster should be supported. Data on agency assisted jobs in Industry in also analysed in the report, and will be the topic of a future blog post. The Western Development Commission (WDC) has just made a submission to DCCAE on the Draft National Energy and Climate Plan 2012-2030 (NECP). The development of clear energy and climate action to 2030 is essential to achieving the national goal of a low carbon economy in Ireland by 2050. The WDC recognises that energy and climate action will bring important opportunities for our largely rural region, but at the same time it will bring challenges that we would wish to see addressed in the NECP. The WDC made a detailed submission to the previous consultation on the draft NECP (November 2018), therefore in this submission we only addressed specific issues arising from this draft of relevance to our region and our remit. The NECP usefully brings together and summarises energy and climate policy. However, much of the focus is on current policy and, while there is a recognition that it will be difficult to meet targets with the policy that is currently in place, there is little information about the additional policies or regulations which will be needed to ensure we achieve targets. The Plan recognises that heating is a particular issue in rural areas (p4) but there is no specific commitment or policy to address the needs of rural areas either in relation heating or transport. Nor is there a recognition that there are unique opportunities for rural areas from the low carbon economy. We believe that specific rural focused policies could be introduced for this. This would have benefit both in terms of achievement of EU targets and in relation to the development of the rural and regional economies. Similarly the NECP acknowledges that the dispersed population pattern results in particular challenges in terms of transportation options. Again there is no specific commitment or policy to address the needs of rural areas. The National Policy Framework on Alternative Fuels Infrastructure for Transport in Ireland 2017-2030 notes that it is likely that in future electricity will fuel the majority of passenger cars, commuter rail and taxis while natural gas and biofuels will play an increasingly important role for larger vehicles like HGV and buses. While we would agree with this, we believe that services such as EV charging points and CNG fueling points must be widely available in rural areas where population is dispersed. Without these services being available and reliable, rural dwellers could be reluctant to adopt the new technologies and it could deter visitors who might be concerned about the availability of charging/fueling points. In the case of HGVs and buses, lack of refueling options could increase costs of delivery or services in more rural and peripheral regions. In relation to the development of the electricity transmission network there is no mention of the issues noted by EirGrid in the recently published Systems Needs Assessment (Nov 2018) in the West (high need for grid development), North West (high need for grid development) and Midland (moderate need for grid development). These need to be included. A study recently commissioned by the WDC, which we blogged about here reviewed the transmission network and current planned renewable generation to identify areas of the Western Region that have transmission capacity for new renewable generation. It found that North Mayo/West Sligo and Co. Donegal have no capacity for new generation without substantial transmission investment. Sligo/Leitrim, South Mayo and West Galway has limited capacity and will require transmission investment in the future. The WDC believes that significant investment is needed in these areas, so that the current and contracted renewable generation requirements are met and that there is potential for further future connections to ensure areas of best resource can produce most. There is a need to review the natural gas network coverage to ensure that it is future proofed to meet the needs of all key urban centres (currently large settlements such as Sligo and Letterkenny are not connected). There is important potential for decarbonisation in the gas network, through the future use of biogas, and through the transmission of gas for CNG refueling. There are also economic benefits for urban centres which are connected to the natural gas network. In the context of the NECP the broader government criteria for developing the transmission network should be reviewed. This should include information from the study of wider benefits of connecting regions to the natural gas which has been undertaken for DCCAE but which has not been published. We welcomed the target of 500K EVs by 2030 but to help achieve this charging investment needs to be early and widespread. This will not just benefit those living in rural areas but will be important for those for those visiting for business or pleasure. Lack of charging points could in future become a disincentive for visitors and could further concentrate tourism and other economic activities in areas near larger urban centres. We agree energy efficiency is important and welcome the ambition to increase the number of homes with a BER rating of B and above. However, the most recent BER ratings data from the CSO shows that currently only 15% of homes assessed nationally have a rating of B or above. In the Western Region only 10% achieve this and it is as low as 7% in Roscommon. This highlights the need to specifically address energy efficiency and home heating issues in more rural and less well-off regions. For dwellings in the in lowest rating categories and the costs and difficulties of achieving upgrade to a B rating are most significant. Most homes in our region use oil for heating. There needs to be a specific effort to encourage change in rural areas which are oil dependent. While many of the incentives are for the installation of heat pumps it should be remembered that the use of wood biomass for heating brings very significant local economic benefits. Employment is only one factor generating trips and the National Travel Survey shows that majority of travel is associated with non-work trips. The importance of these non-work trips and the potential for change in this demand needs to be more central to climate action planning. Rural people are reliant on car based transport, they have little available public transport and tend to travel greater distances. Therefore clearly rural dwellers’ transport demand patterns need to be central to planning for climate action. There must be detailed consideration of transport issues for smaller settlements and rural areas. The majority of the population will continue to live in the historical settlement pattern and spatial planning will not change that pattern significantly to 2030 or even in the longer term (to 2050). Thus the NCEP needs to focus on current spatial patterns. In conclusion, the WDC believes that it is essential that part of the NECP should have a specific focus on issues for rural areas, and on actions to ensure that rural areas are both in a position to benefit from a move to a low carbon economy and to meet the challenges of doing so. This will enable them to make a fair contribution national goals in relation to renewable energy and to actions to mitigate climate change. Last week the WDC made a submission to the public consultation being held by the Northern & Western Regional Assembly on their Draft Regional Spatial and Economic Strategy. The submission is available here. As we’ve provided substantial input previously to the preparation of the Draft RSES, in this submission we mainly comment on the specific text and content of the Draft RSES document and pay particular focus to the 211 Regional Policy Objectives set out. Adapting the ‘city-led development’ approach of the National Planning Framework (NPF) to a highly rural region presents a considerable challenge. The RSES for the NWRA Region needs to have flexibility to take an approach more suited to the rural nature of its settlement pattern. Rural areas provide much of the urban workforce and urban demand. Rural-urban interlinkages, including travel to work patterns, need to be given greater consideration. Job creation in smaller towns, villages and rural areas, as well as remote working, can bring closer alignment of housing and jobs. Building more houses in large urban centres is not the only route to greater alignment. Many of the Regional Policy Objectives do not include detail of how they will be implemented, who will be involved in leading or implementing them or the timeframe for implementation. A mechanism is needed to achieve the required alignment of a large array of national, regional, local, sectoral, public and private organisations, policies, priorities and strategies to ensure implementation of the RSES. It needs to be clear what will happen if the priorities of a Government Department or sectoral agency conflict with the RSES. The Atlantic Economic Corridor (AEC), as an agreed place-based platform for economic growth, should be designated as an Economic Zone in the RSES. Adopting a ‘sector’ approach to economic and enterprise development misses out on many ‘cross-cutting’ themes e.g. digitalisation, AI, finance. There is an urgent need to review national Ports and Aviation policy to move away from the ‘business as usual’ approach which reinforces the dominance of Dublin Port and Airport. Delivering Atlantic Corridor road projects (on the N17/15) should be prioritised to take place earlier (no commitment in current NDP to begin construction before 2027). Some care is needed in focusing on ‘infrastructure corridors’ – this approach will not work in all circumstances and areas distant from such ‘corridors’ risk further disadvantage. RSES should contain a stronger commitment to the extension of the natural gas grid. RSES needs to focus on improving living standards for residents of the Region as a key objective in its own right, rather than simply as a way to attract companies and support business. More reference is needed to the potential impact of Brexit. Following the public consultation (which closed on 8 February) the NWRA will prepare a report on issues raised in submissions/observations and recommend whether the RSES should be made with or without amendments. It may necessary to hold another phase of public consultation before the RSES can be finalised. You can check for updates on the process here. The Draft Regional Spatial and Economic Strategy for the Southern Regional Assembly is still open for consultation, with a deadline of 8 March 2019, and a future post will discuss the WDC’s submission to that consultation. Measuring Rural Poverty – It’s Complicated! The CSO released the latest data on Income and Living Conditions last December, see here. The headline figures indicate a rise in incomes – increasing by 4.7% between 2016 and 2017, which in turn was higher than the figures five years earlier, in 2012 (see earlier post on this here). This is in line with other national economic indicators such as continuing economic growth, employment growth and decreasing unemployment. Within the same CSO release, the data show that the at risk of poverty rate decreased from 16.2% in 2016 to 15.7% in 2017. Examining the at risk of poverty rate spatially, the rate is higher in rural areas, compared to urban areas; the at risk of poverty rate in rural areas is 17.2% in 2017, compared to 15.1% in urban areas. Moreover the trend over the last two years shows a divergence, with the urban rate declining – from 15.9% to 15.1%, while the rural rate increased from 16.9% to 17.2%. The CSO release also provides a breakdown by region. The data indicates that the at risk of poverty rate is higher in the more rural regions (Northern and Western) with 21.8% or over a fifth of the population there at risk of poverty. This is in contrast to the rate within the Southern region (16.8%) and it is lower again in the more urban Eastern and Midland region (12.8%). The CSO also measure the deprivation rate, which is a broader measure than poverty and is defined as follows: Households that are excluded and marginalised from consuming goods and services which are considered the norm for other people in society, due to an inability to afford them, are considered to be deprived. This measure of the marginalised or deprived is currently achieved on the basis of a set of eleven basic deprivation indicators as follows. Individuals who experience two or more of the eleven listed items are considered to be experiencing enforced deprivation and this is the basis for calculating the deprivation rate. The deprivation rate nationally has shown a decrease between 2016 and 2017, from 21% to 18.8%. At a spatial level it appears that there is a higher rate of deprivation in urban areas than in rural, in 2017 the urban deprivation rate was 20.2%, while in rural areas it was 15.9%. Similarly the more rural Northern and Western Region has a lower deprivation rate in 2017 (17.3%), compared to 18.7% for the Southern Region and 19.5% for the Eastern and Midland region. Nationally the rate went from 8.2% in 2016 to 6.7% in 2017. At a spatial level, like the deprivation rate, the consistent poverty rate is slightly higher in urban areas than in rural areas. In rural areas the rate was 5.3%, compared to 7.4% in urban areas. Measuring Deprivation: Access to Services? The measurement of poverty in its various ways has become a lot more sophisticated than a simple examination of income. The at risk of poverty rate and the deprivation measurement places poverty in the context of the society and environment in which it occurs and this is welcome. It is often said that rural poverty, is more hidden or less visible than urban poverty. Overall the CSO recent data show that rural areas have a higher at risk of poverty rate, compared to their urban cousins, but have lower deprivation and consistent poverty rates. However the definition of deprivation is based on enforced deprivation where there is an inability to afford goods and services. But what of the inability to access goods and services because they are not available in the locality. Is the inability to access broadband a deprivation? Many rural residents think so. It impacts on their ability to access goods and services on-line and often impacts on their ability to generate their incomes, for small businesses and the self-employed. And, in the absence of broadband, what of access to services such as banks and post offices? Is it enforced deprivation, when these services were once available within the community and are no longer there? Is it enforced deprivation when access is not available online and there are limited if any transport services to travel to the next available centre to access the closest banking or post office facilities? Most would consider Yes, that this is enforced deprivation. Those communities that are not being served by the commercial broadband providers now and are awaiting a decision to start the National Broadband Pan (following its original announcement seven years ago) are and will continue to remain deprived for years to come. On 4th February this year, Social Justice Ireland, issued a press release entitled Time for Government to commit to eradicating poverty, see here. In it they point to the importance of being able to access high quality public services. On the same day, Social Justice Ireland published their Social Economic Review 2019, which highlights in detail the importance of access to broadband, financial services and other public services in helping to deliver a fairer Ireland. The publication has a specific chapter on the issues and challenges for all those living in for rural and regional Ireland see here. Since 2014 areas are now classified as Urban or Rural based on the following population densities derived from Census of Population 2011: Urban – population density greater than 1,000, and Rural: Population density <199 – 999 and Rural areas in counties. Last July I published a blog post Nuts about NUTS! where I discussed the introduction of the new regional classification for statistics in Ireland. Briefly, a new regional classification for collecting statistics in Ireland was approved by the EU in 2016, following the Local Government Act 2014 and the establishment of three new Regional Assemblies. The CSO first used this new regional classification in the Labour Force Survey for Quarter 1 2018. It has since used the new regional classification in any data release which includes regional data. NUTS2 Northern & Western: Composed of NUTS3 West (Galway, Mayo, Roscommon) and NUTS3 Border (Donegal, Sligo, Leitrim, Cavan, Monaghan). NUTS2 Southern: Composed of NUTS3 Mid-West (Clare, Limerick, Tipperary), NUTS3 South East (Wexford, Waterford, Carlow, Kilkenny) and NUTS3 South West (Cork, Kerry). NUTS2 Eastern & Midland: Composed of NUTS3 Dublin, NUTS3 Mid-East (Wicklow, Kildare, Meath, Louth) and NUTS3 Midlands (Offaly, Laois, Westmeath, Longford). 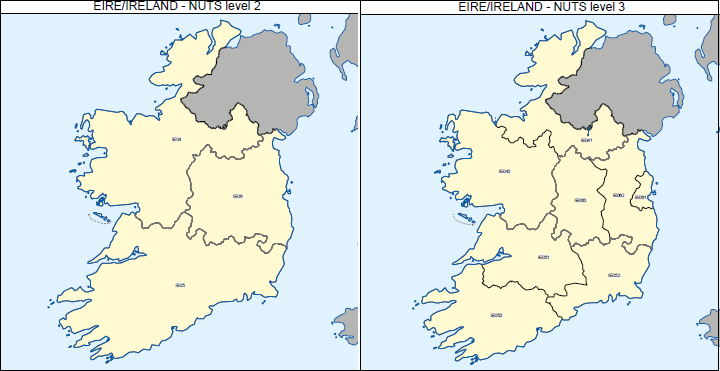 The changes at NUTS3 level are the transfer of South Tipperary from the South-East NUTS3 region into the Mid-West NUTS3 region (following the amalgamation of North and South Tipperary Councils) and the movement of Louth from the Border NUTS3 region to the Mid-East NUTS3 region. Therefore four out of the eight NUTS3 regions changed and four (West, South West, Dublin and Midlands) remained the same. The CSO published an Information Note on the revisions. Which NUTS3 regions? It is easy to tell the ‘new’ classification when it includes the NUTS2 regions. If you see Northern & Western, Southern and Eastern & Midland you know it is the ‘new’ one. However as the names of the NUTS3 regions remained unchanged, when you just see a list of the NUTS3 regions, it is not clear if the ‘old’ or ‘new’ classification is being used. A good example of how this can be confusing was the recent Census of Industrial Production 2016. In this release data was provided for five NUTS3 regions (Border, Dublin, Mid-East, Midland and West) as the data for the South West, South East and Mid-East were suppressed for confidentiality reasons. No data was therefore given in the release publication for the NUTS2 regions. Reading the release it was not clear which regional classification was used and it was not included in the Background Notes to the release. Only by going into Statbank to download the data, and seeing the NUTS2 regions of Northern & Western etc. listed was it clear that the ‘new’ classification was used. When using the CSO’s Statbank system, a ‘Note’ will usually appear in a dialog box at the top of the page (see below), and also at the bottom of the spreadsheet you download indicating if the new regional classification is used. If you are looking at a published CSO ‘Release’ such as the Adult Education Survey 2017, then the regional classification is usually included in the ‘Background Notes’. Different CSO data sets: As mentioned above, any new data (which includes a regional breakdown) issued by the CSO since mid-2018 is issued using the new regional classification. However data sets published prior to that use the older classification. So for example the most recent Labour Force Survey data, which measures employment and unemployment, uses the new regional structure but the County Incomes and Regional GDP 2015 data issued last February uses the older classification. Therefore a report or analysis drawing on a number of different CSO data sets may find that the regional classifications are not necessarily comparable. Different data sources: While the CSO has adopted the ‘new’ regional classifications for all releases, this may not be true of all data providers. Earlier this year the IDA issued its end of year results for 2018. The results included data for the number of jobs in IDA-backed companies by region and the annual change. The release did not specify which regional classification was used, so it was unclear if their ‘Border’ was the ‘old’ region including Louth or the ‘new’ region without Louth. I got in touch with IDA and they confirmed they were continuing to use the ‘old’ regional structure as it aligned with their regional office structure, the regional targets set in their Strategy and current EU State Aid regulations. Their intention is to switch to the new structures from 2020. While this is very understandable, it does raise the possibility for some confusion and misunderstanding. For example someone may compare total employment in the Border region in 2018 (derived from the LFS and using the ‘new’ regions) with employment in IDA companies (derived from IDA results and using the ‘old’ regions) without realising the two ‘Borders’ are not the same region. This clearly illustrates the need for all data providers and users to state which regional classification is being used. 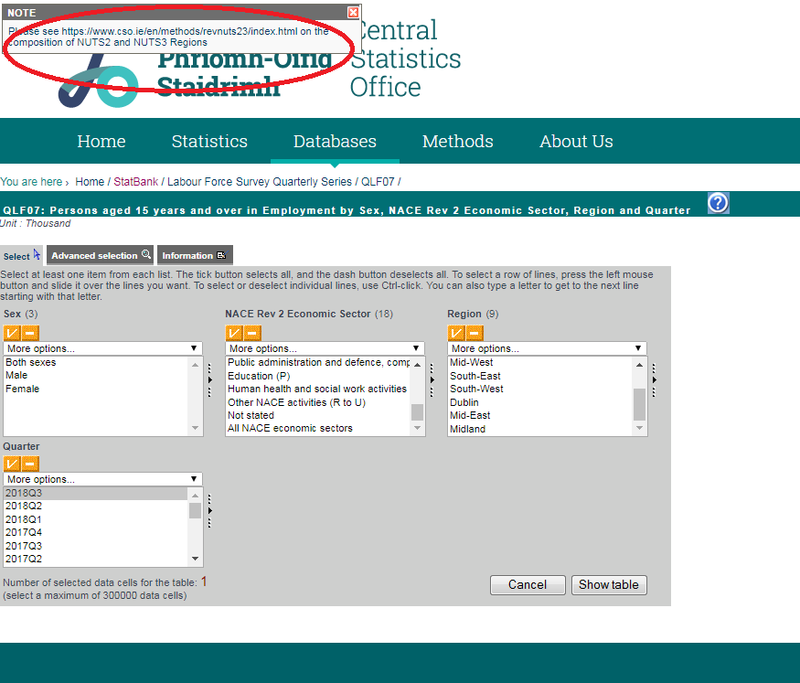 Time series: When releasing new regional data with the ‘new’ classifications, the CSO are (where applicable) issuing ‘backdated’ results for the ‘new’ regions to 2012, so for example in the CSO’s Statbank if you go to the Labour Force Survey, you can download data for the ‘new’ regions for each quarter from Q1 2012 to Q3 2018 (latest). Clearly recoding and backdating massive data sets with new classifications is a time-consuming task and providing six years of time series data is very welcome. However it does mean conducting time series analysis at regional level (except for the four ‘unchanged’ NUTS3 regions) further back than 2012 involves a break in the data at 2012. This break in the time series can cause some confusion, an example was the Survey on Income and Living Conditions (SILC) published late last year. The CSO used the new classification for the 2017 release and backdated to 2012, with the data prior to that (2004-2011) using the old classification. They noted this in the dialog box (see below) and download in Statbank and in the ‘Information Note’ for the release. However, there were examples of commentary by people comparing the regional poverty data from 2008 and 2017 without making reference to the fact that for four of the eight regions, the data for the two periods was not directly comparable. Also, while the CSO have committed to providing backdated time series for the new regions to 2012, it is not clear if all data providers will do the same. Therefore it is important to check. Check: When looking at or downloading any data at regional level, check which regional classification is used. For CSO data, it is usually included in a ‘dialog’ box in Statbank and the Background/Information Note for the release or if the data includes NUTS2 data it is easy to tell. In general any CSO data issued since June 2018 uses the ‘new’ classification and anything issued before that will be the ‘old’. 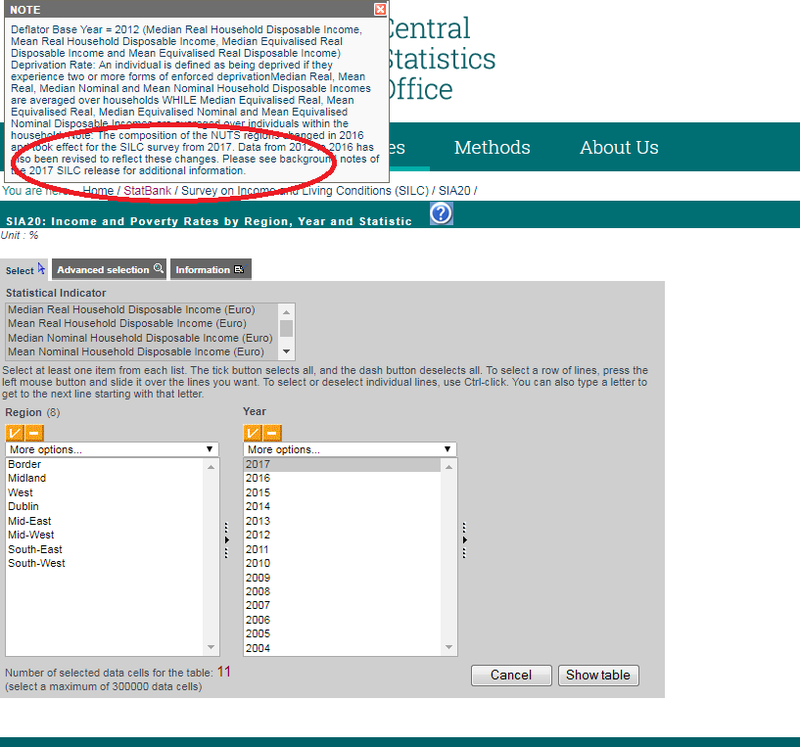 Also be sure to check if (and how far) any backdating of the data has been done, for CSO it will generally be to 2012. Other data sources would need to be checked on a case by case basis. Ask: If it is not stated or clear from the release or data, contact the data provider to check. The more people who make a query, the more conscious all data providers will be to clarify which classification is used. Say: If you are a data provider and publishing data at regional level, be conscious to explicitly state which regional classification is used. If you are a data user and are publishing analysis or commentary using regional data, clarify which classification you are using. This is particularly critical if multiple data sets or sources are used with different regional classifications. 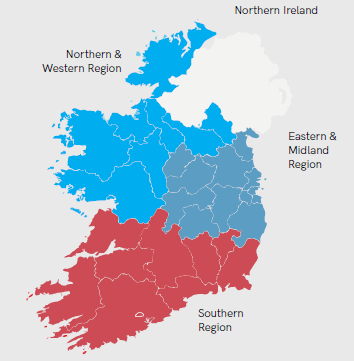 While this may all seem a little pedantic, given the current interest in the impact of Brexit on the border economy, knowing if someone discussing data for the Border is discussing a Border including Louth (with Dundalk and Drogheda) or a Border excluding Louth, could make quite a lot of difference. 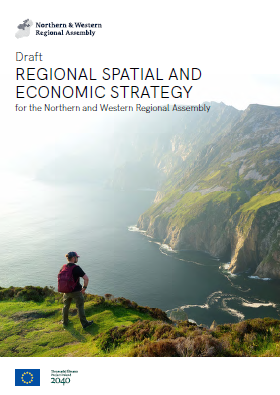 Just a reminder that the Draft Regional Spatial and Economic Strategy for the Northern and Western Regional Assembly (NWRA) is currently out for consultation, with a closing date of 8th February 2019. The National Planning Framework (NPF) published last year, provides a framework for development and investment over the coming years. Under the umbrella of Project Ireland 2040, it was published with its companion, the National Development Plan (NDP), a 10 year strategy for public investment. The NPF is a framework for the development needed to underpin population growth in Ireland of up to 1 million people (by 2040) with approximately 50% of this growth to be in the five main cities. The Framework is underpinned by 10 National Strategic Outcomes and, central to it, is the concept of Compact Growth identifying where new growth can take place within the existing envelope of our Cities, Towns and villages. The primary vehicle for delivering the NPF is through the implementation of Regional Spatial and Economic Strategies (RSES) for each of the three NUTS 2 Regions shown on the map below. The Assembly in each of these Regions (the Northern and Western Region, the Southern Region and the Eastern and Midlands Region) has a draft RSES currently under consultation. The draft NWRA Strategy can be viewed or downloaded here. On Line: Completing the RSES Web Submission Form available here. The focus of this post has been on the NWRA RSES. In a future post we will outline key elements of the Draft Regional Spatial and Economic Strategy for the Southern Regional Assembly (consultation closing date is 8th March 2019). The Eastern and Midland Regional Assembly Draft RSES is also currently out for consultation, with a closing date of 23rd January 2019. The WDC recently published the third in our ongoing series of ‘Regional Sectoral Profiles’ analysing employment and enterprise data for the Western Region on specific economic sectors and identifying key policy issues. The new report examines the Education Sector, the Western Region’s fourth largest employer. The Education sector plays a vital role in society, educating our young people, providing lifelong learning and personal development opportunities, as well as the necessary skills for the economy. It includes all those working in public, private or community/voluntary pre-primary, primary and secondary schools (e.g. teachers, support staff) as well as staff of further and higher education institutions and colleges. The sector also includes other types of educational activity such as music schools, adult education and driving schools. Discussions of the Education sector generally focus on provision of services. This ‘Regional Sectoral Profile’ however focuses on its role as a key economic sector and regional employer. 32,349 people were employed in the Education sector in the Western Region in 2016. Education plays a greater role in the region’s labour market than nationally, accounting for 9.7% of total employment compared with 8.8%. Education is most important in Donegal (10.8% of all employment), followed by Galway County (10.2%). These are the highest shares working in Education in the country. Moycullen in Co Galway (19%) has the highest share of residents working in Education across Ireland’s 200 towns and cities. The towns with the next largest shares in the region are Bearna (13.3%), Strandhill (12.2%) and Carndonagh (11.9%). It must be noted that this data refers to residents of the towns, although some may travel to work elsewhere e.g. NUI Galway, IT Sligo. The number of people working in Education in the Western Region grew by 4.4% (2011-2016), weaker growth than the sector nationally (5.7%) and also weaker than total employment growth in the region (7.5%). At 32.2% and 25% of total Education employment respectively, ‘Primary’ and ‘Secondary’ are the two largest Education sub-sectors, with a higher share working in both in the region than nationally. In contrast the region has a lower share working in ‘Higher Education’ (15.2% v 16.8%). ‘Pre-primary Education’ saw the strongest jobs growth, +44.8% in the region (2011-2016) largely driven by introduction of the Early Childhood Care and Education (ECCE) Scheme providing a free pre-school place to all children. 7% of all working women and 4.4% of all working men in the Western Region work in Education. The sector plays a more significant role in both female and male employment in the region than nationally. In 2016 there were 2,710 Education enterprises registered in the Western Region. Education enterprises account for 5% of all enterprises in the region, above the 4.4% share nationally. Sligo is where the sector accounts for the largest share of enterprises (5.5%) with Clare and Galway next highest (5.2%). Higher reliance on the Education sector in the Western Region: Education is a more significant employer in the Western Region than nationally and plays a critical role in providing professional career opportunities, including in more rural areas where there may be fewer alternatives. While the main focus for Education policy must be the provision of quality services, the sector’s parallel employment role should also be a factor in policy decisions. Central role in female employment: 3 out of 4 people working in the Education sector in the Western Region are women. Galway City has the lowest female share, and Roscommon and Leitrim have the highest, indicating that Higher Education has lower female involvement than other Education sub-sectors. Any future development in Education will have a far greater impact on female than male employment levels. Demographic Factors: The most recent projections from the Department of Education and Skills indicate that primary school enrolments peaked in 2018, while for second level education the numbers are projected to peak in 2024. The expected decline in demand for primary and secondary education in the medium-term will impact on future Education employment trends. Demand for third level education is more varied. As well as direct transfers of young people from secondary school, demand also comes from mature students returning to education and from international students, while staff are also engaged in other activities e.g. research, which are separate to student enrolments. Lifelong Learning: There is increasing recognition of the importance of lifelong learning and the need to continually update skills, or acquire new skills, to adapt to changing technology and an increasingly flexible labour market. As well as the demands of the labour market, lifelong learning is also pursued for personal development. There are regional differences however in participation in lifelong learning. In the Border region, just 5% of adults were engaged in formal education, in the West region it was 8% while it was highest in Dublin at 12%. Meeting the Government’s target of 10% of adults to be engaged in formal lifelong learning by 2020 (15% by 2025), particularly in the Border region, will require a very substantial increase in participation representing a growth opportunity for the Western Region’s Education sector. Regional Skills: The Education sector is largely responsible for providing skills needed by the regional economy; skills needs which are continually changing. Provision of regional skills involves a wide range of education providers and close engagement with employers. Regional Skills Fora provide a useful structure. Changing skill demands impact on Education employment, as emerging skill needs can only be met if Education professionals with expertise in these new areas e.g. artificial intelligence, big data, are available. Emerging Opportunities: The introduction of the ECCE had a very dramatic jobs impact on Pre-primary Education. This shows the potential for developing new opportunities in the Education sector, where job creation may not be the main objective but is nonetheless an important outcome. Brexit presents another potential opportunity. It is estimated that 10,000 students from the Republic of Ireland study in Northern Ireland or elsewhere in the UK and institutions such as Letterkenny IT and IT Sligo in the Western Region, could attract some of these students. Also students from EU member states wishing to study abroad in an English-speaking country are more likely to choose Ireland following Brexit. Another opportunity is the Western Region’s growing number of retired people who represent potential new demand for Education services. Given demographic trends, increased demand for Education services from adults, including retired people, is an area of potential growth. CSO (2018), Adult Education Survey 2017 Note this refers to the revised regional classification which began to be used by the CSO in 2018. The Border region includes Donegal, Sligo, Leitrim, Cavan and Monaghan. Louth, which was previously included in the Border region, is now in the Mid-East region. The West region is unchanged (Mayo, Galway and Roscommon). Formal education is education provided by an institution with a programme of study recognised by the national authority and lasting at least 6 months.